There’s something to be said about looking out your window and seeing your horse relaxed and happy in your barn or pasture. And there’s the convenience to be able to take just a few steps out your door and be ready to tack up and ride in a few minutes. Is horse keeping on your own property a better option for you and your horse than boarding at a stable? If you’ve never owned horses before, starting at a boarding stable with a knowledgeable barn manager, workers and trainers is a good option. Boarding at a stable can result in reduced horse care costs. Remember that boarding stables often buy hay and bedding in bulk because they have the room to store it. And they will be the ones to drive to get the hay and grain and unload it. Like to take a vacation? With a boarding stable, there’s always someone to feed your horse. When your horse is at home, that person is you. Vet visits are another cost that can be reduced with other horse owners. Vets charge a “farm call” fee in addition to any medical treatment. With a stable full of horses, there is usually someone else at the barn who’d like to talk to the vet or have him take a look at their horse while he’s there. You can usually split the farm visit fee with another boarder. Spring /fall shots and dental visits are another way to save money. Boarding stables often have “shot clinics” where the vet comes out and all the shots are done at one time. The same is true for dental work. Again, this saves you the cost of the farm call fee. Farrier services can be difficult to find if you only have one or two horses and live in a remote location. Farriers often like to work at boarding stables where they can go to just one place, set up once and shoe numerous horses. It may not be worth his time to have you as a client if most of it is spent driving to and from your barn. If you plan to show your horse, you’ll need your own trailer to get to the show or clinic. However, if you’re at a boarding stable, it’s possible that others from your barn will also be going and it’s likely you can add your horse to their trailer. There’s the camaraderie principle. This doesn’t have a cost, but after a few months of keeping your horse at home, you may find you miss the social aspect of being at a barn. It’s nice to talk to someone after a good lesson or have a shoulder to cry on after a bad one. Keeping your horse at home might be a great experience – and, of course, Classic Equine Equipment is always available to help you design and build your dream barn. But, before you start thinking about location, construction materials, stall types and amenities, decide if home horse keeping is right for you and your horse. Your horse doesn't have an e-mail address, but you do! Stay updated with industry news. Learn valuable tips on maintaining a healthy and happy environment for you and your horse. 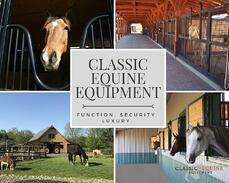 Receive exclusive information on Classic Equine Equipment products, specials and upcoming events!